*Minimums may apply. Fill out the form to speak with a Social Intelligence sales representative for complete details. What is a Social Media Hiring Report? 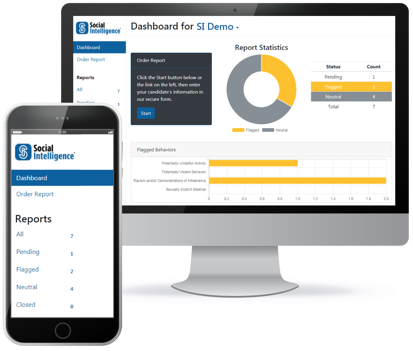 With just the right mix of software automation and experienced social media analysts, Social Intelligence identifies a candidate’s potentially problematic online activity and provides you with an FCRA-compliant report to use in your hiring decision. 70% of employers in the U.S. understand the importance of online behavior in today’s digital world, but most are screening candidates social media in an inefficient or illegal way. A third-party is needed to ensure the privacy of the candidate and mitigate any risk of discrimination accusations against your team. Making social media screening scalable without compromising its meaningful value for organizations of any size has always been our mission. Social Intelligence takes a human approach to social media analysis through a technology lens, employing machine learning with FCRA-trained analysts who can identify wholly human patterns like parody, sarcasm, or innuendo in flagged content. In effect, we've married content and context to guarantee than nothing is misinterpreted or falsely attributed to your candidates while providing valuable insight for their fitness in your workplace. All protected class information is redacted before you receive a report so your business doesn’t assume any discrimination or privacy risk when using our screening services. Hear from a few of our early adopters. Social Intelligence provides well-crafted reports and goes above and beyond any other media search. Social Intelligence offers the flexibility and investigation that we require. CSI can rely on Social Intelligence to provide us the quality reports that we need for high level security consulting. Our clients are able to uncover candidate behavior that could potentially put their company, brand or employees at risk. Since search results are thoroughly vetted by a team of trained analysts, the information provided to clients is fully compliant with Federal and State hiring regulations. Social media reports help to determine if the general attitude of a candidate is both a good fit for that workplace environment, or if there are the types of red flags that may lead to potential liability issues. Our Fortune 500 clients conduct focus groups and the last thing they need is misguided personality types representing their brands.